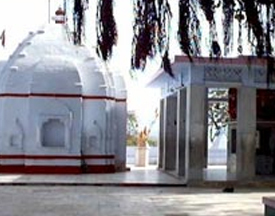 The cave temple dedicated to Baba Balak Nath is located on the spur of a hill in Deoth-Sidh town of Distt Hamirpur. Also known as SRI BABA BALAK NATH SIDHPEETH, this pilgrimage has a strong relation with ‘Siddha Tradition’ in Hindu Mythology. It is located at a distance of 30 K.M. from Hamirpur town and is easily approachable. The temple covers an area of less than 2 Sq. K.M. and can be covered within 4 hours. One can reach the Sidhpeeth by bus, train and airway. 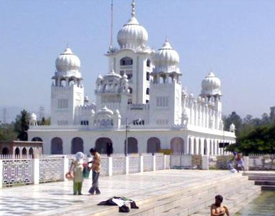 Guru ka Lahore is popular cluster of three Gurudwaras located in Distt Bilaspur at a distance of 12 K.M. from Anandpur Sahib in Punjab. Three Gurudwaras are Gurudwara Triveni Sahib, Gurudwara Paur Sahib and Gurudwara Sehra Sahib. This cluster was formed to create an identically-looking “Lahore” as it was not politically advisable to go to Lahore for Guru’s wedding. So, the marriage of Sri Guru Gobind Singh with Jeet Kaur took place in 1734 at this place. Established in 1627 by Sri Guru Hargobind, Kiratpur Sahib is a location of Gurudwara Patal Puri, where Sikhs take ashes of their dead. It is situated on the bank of Sutlej River on Nangal-Rupnagar-Chandigarh road. Kiratpur Sahib is a sacred place for Sikhs as it is a folklore that Sri Guru Nanak Dev visited here when it was not much developed. 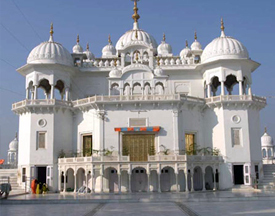 Anandpur Sahib is located in Distt Rupnagar of Punjab and one of the most important holy places for Sikhs. It was founded in year 1665 by Sri Guru Tegh Bahadur. The festival of Holi is named as “Hola Mohalla” here as named by Sri Guru Gobind Singh and attracts over 1,00,000 devotees every year. 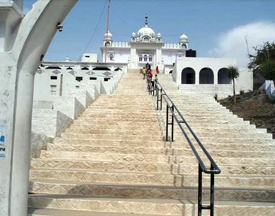 Popularly known as Dholra Temple and Bajia, Baba Nahar Singh Temple is located on the bank of Gobind Sagar Lake. It is one of the most famous temples of Bilaspur Distt. Baba Nahar Singh was himself known as Peepal wala, Bajia and Dalian wala. 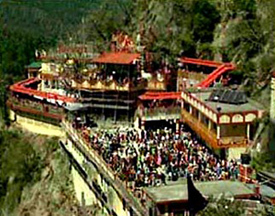 The temple was built by the queen of Kullu in the honor of Baba Nahar Singh.